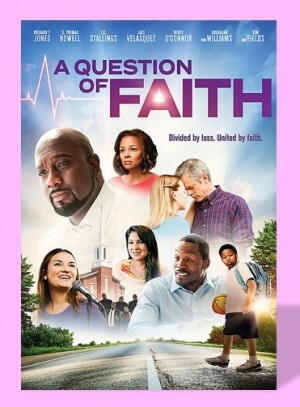 A Question Of Faith is an inspiring and encouraging film which wonderfully portrays the message of faith, grace and forgiveness. The film follows three families whose lives intersect after a chain of tragic events. We see Pastor David, a loving husband and father who is about to take over his dad’s church whilst neglecting his family and the promises he made to his 12 year old son Eric. There is a single parent, restaurant owner whose teenage daughter is very free-spirited. We also follow the owner of a failing construction company, whose daughter is about to sign a record deal. The tragic circumstances these families all find themselves in really shake them to core and it is at that point we see how they cope and how all their lives change and how they can be redeemed through Christ. The film is well written with each person’s story intersecting in a natural way that brings them closer together. The acting really moves the story, portraying each character as believable. We feel the pain and suffering, we see them question their beliefs and we ultimately see them strengthen in faith, hope and redemption. Alongside the messages of faith and forgiveness there are two strong messages of organ donation and also advising people not to text and drive. These two messages are made hard hitting with the storyline and will make you think, it will make you consider signing up to be an organ donor if you are not already and will make you think twice before texting and driving. Overall A Question Of Faith is a strong film with some strong messages. It will help encourage those facing difficult times, helping them to seek Jesus and to have faith. It will help people to forgive and it will prompt people in other ways. Ultimately we see that just one life can save many lives, not just physically but also spiritually. A Question of Faith is due for release on 29 June 2018.